Like everything else in Hagen’s tidy confines, the old fashioned door chimes, the smoked fish aroma, and the friendly service beckon a step back to an era when butcher shops and mom-and-pop-style deli’s dotted the city’s streets. No one knows the exact date when the two Hagen brothers and their wives opened the market in 1946, but when asked they’ll tell you, “it was sometime in summer.” Their father, a commercial fisherman on Washington Island, WI, mortgaged the family home to provide the brothers with enough seed money to start their own store. They decided to build in an area “on the outskirts of Chicago” (Montrose & Parkside) because they could afford the land. They recall fellow church members feeling sorry for them for opening a business “so far out in the middle of nowhere.” Determined to succeed, the brothers and their wives worked long hours, insisted on selling only the very freshest fish, and made their customers feel welcome and appreciated. Over the years as the business grew, the family looked on as the Jefferson Park and Portage Park neighborhoods also grew around them. 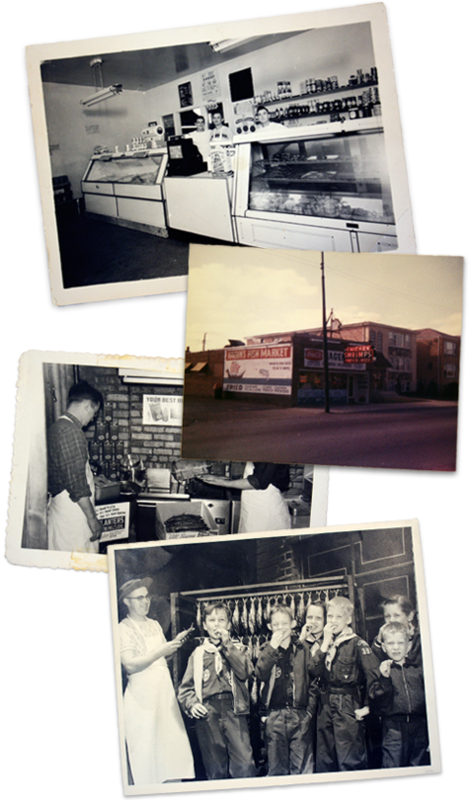 Around 1975, the second generation Hagen’s joined the family business and added their own magic touch to the store. The selection of fresh fish more than tripled as they saw an opportunity to bring in fresh fish directly from the East Coast several times per week. They also added some delicious new recipes which have become long-standing staples for customers, such as Charlene’s Crab Dip. After almost 73 years of serving the Jefferson Park and Portage Park communities in Chicago, Hagen’s Fish Market is alive and well, a thriving family business that people rely on not to change. Click Here to .read the rave review of Hagen’s Fish Market. It’s the kind of fish place I dream about, a place to buy top quality fish, cooked to order. The Beat Cop’s Guide to Chicago Eats is a handbook for people in Chicago hungry for food that’s good, fast, and cheap. I’m always amazed when I mention Hagen’s to people in my neighborhood and they’ve never heard of it. Hagen’s has been smoking fish for over sixty years at Central and Montrose in Portage Park. For $1.85 per pound, they’ll hang your freshly caught fish in their cinderblock smokehouse and return them to you, transformed by the alchemy of oak smoke and gravity, into a divine treat. What I love about Hagen’s is the fried shrimp cooked while you wait. I always wonder if shrimp are aware that some quirk of fate made them delicious and if they are pissed about that. The store is dominated by the cooler loaded with shrimp and fish that you order by the pound. They fry it up and you get it in a paper bag, along with the sauce of your choice. There are no tables at Hagen’s — it’s all take out. If you’re on a beat, you have to sit out in the squad car in the parking lot and eat. The prices for shrimp are about the same as what they are in a grocery store, and they change all the time. But they’re worth it. If you’re going to spend the money, might as well get good, really fresh shrimp. The dazzling selection of freshly caught smoked fish may cause lesser humans to swoon. The smoked salmon steaks have been known to cause hearty New Englanders to kick themselves in the Chesapeakes for not moving to Portage Park so they can get some real fish. But the telling detail, the simple little truth that makes Hagen’s world class, is their hush puppies. Just as any great southern joint must be judged not by its fried chicken but its slaw, any good fish joint must be judged on the delicate tooth, the humid interior, the flaky, cakey, achy-breaky delight of its hush puppies. Hagen’s hush puppies are so frightfully superior, so addictively delicious, you will forget you came there to get some fish. Having scoured this great country in search of the best hush puppies around, I can confidently claim only Jacque Imo’s in New Orleans can boast a better pup — and they had to add garlic, alligator, and crawdaddies to get past Hagen’s hush puppies.